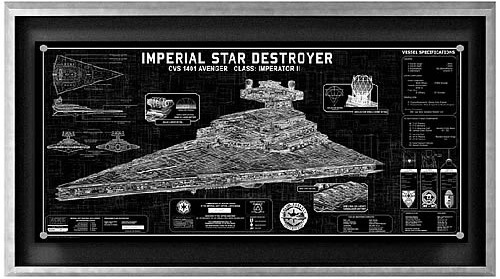 Imperial Star Destroyer Framed SpecPlate | OhGizmo! Thankfully, a long time ago in a galaxy far, far away, someone had the foresight to remove the SpecPlates off a handful of Imperial Star Destroyers before they were sold for scrap after the Galactic Empire fell. And now, many unspecified years later, they’ve made them available for sale. Each plate is 36 inches wide by 17 inches tall and made of 1/8 inch aluminum, and there’s only about 25 of them up for grabs, so the $1,994.99 price tag (available March 2010) is understandable. Now it might not be the most affordable collectible for every Star Wars fan out there, but if your ancestors served on one of these ships during the Clone Wars, it might be a nice way to remember them. I know someone's birthday in March, I bet he would love that. Too bad it's freakin expensive. Very sharp though.